Amy and Captain Holt get overexcited to work with Dr. Yee on Brooklyn Nine-Nine Season 6 Episode 10. 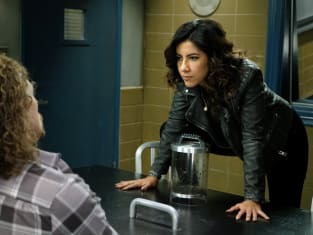 Brooklyn Nine-Nine Season 6 Episode 10: "Gintars"
Brooklyn Nine-Nine Review: Did Jake Go Too Far? Hi Jake! I love you! Permalink: Hi Jake! I love you! Amy: No one pushed Boyle down the stairs. Holt: Right. We may have plastered his eyes shut and forced him to roam around blindly but he fell down on his own. Permalink: He fell down on his own.